The Mani mantra is the most widely used of all Buddhist mantras, and open to anyone who feels inspired to practice it -- it does not require prior initiation by a lama (meditation master). The vowel in the sylable Hu (is pronounced as in the English word 'book'. The final consonant in that syllable is often pronounced 'ng' as in 'song' -- Om Mani Padme Hung. 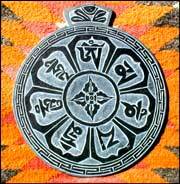 There is one further complication: The syllablePad is pronounced Pe (peh) by many Tibetans: Om Mani Peme Hung. Gepost door DA op 2:05 p.m.
"Almost thou persuadest me to be a Christian"
but you, Dimitri -"almost thou persuadest me to be a Buddhist"
This is a wonderful blog. Soothing yet inspiring. Don't let Zee tweak you. He's a good person. As are you. I think you have a beautiful soul. I practice a wonderful meditation using this mantra. I don't do it every day as it is not the main meditation in my practice, but I love the way the meditation of the buddha Chenrezig makes me feel. I wear a prayerwheel as a necklace every day so I get the blessing from the mantra everytime I move. ...so very impressed by how many wonderful posts you have created in so short a time. Namaste. Showing my ignorance here. I am ignorant about this mantra and most likely I am ignorant about Buddhism as well. But I'm eager to learn and hope someone here can help. I have been curious about this mantra for decades. Raised Catholic and still smarting from years of being told not to ask, it's hard to accept that the phrase cannot be translated and that I should simply leave it at that. And that I should just use the words without any understanding at all... seems to make no sense in the Buddhist tradition. Isn't Buddhism faithful to one's mind and logic, one's ability to question and test beliefs and ideas? When syllables are empty of meaning our minds will fill something in. That doesn't seem in tune with the Buddhist perspective, either. The mantra cannot be translated easily? Wonderful and so be it! But let it stop there? No way. Let's understand that translations might come up short and we are all on a journey to fuller understanding.